This ANA 777 First Class Review is my husband's, for his NYC JFK to Tokyo NRT flight a couple weeks ago. ANA uses Terminal 7 in JFK, and because British Airways' First Class Lounge is being renovated (which it badly needs) ANA First Class passengers only have access to the British Airways Galleries Business Class Lounge. ANA First Class offers 8 open suites in a 1-2-1 configuration across two rows. As I was flying solo, my wife chose 2K for me, so that I wouldn't be too close to the lavatories or galley and could sleep better. Couples, unless they want/need windows, will want to choose center suites such as 1D/1G or 2D/2G. I'd recommend 2D/2G for the same reason–the 2nd row is a bit more private and less exposed to the galley light and noise. As mentioned, I was in seat 2K, a window seat. The ANA First Class seat didn't seem that large compared with other first class seats I've been in. In fact, I'd go so far as to say that you can't be too wide, otherwise it won't be comfortable. In my case, the width was fine (although not much room to spare) but the contoured head rest hit my shoulders, which was uncomfortable. There was no way to adjust this, either. I've never experienced this type of awkwardness with the seat headrest before in any first class. Evidently ANA did not test this seat out with its tallest passengers. I eyed the seat controls, looking forward to when I'd be able to recline the seat, after take-off, or even put it into bed mode so as to get rid of the discomfort of the headrest hitting my shoulders. On the positive side, there were many convenient compartments within easy reach that could be used to hold small electronics, and the one housing the IFE controls even had a mirror. I decided to try the Western menu (if curious about the Japanese menu, see my wife's ANA First Class review from last year). The first offering was an amuse bouche trio, with my favorites the truffle-flavored scallop with cauliflower soup and the cheese pepper bread sticks. The crab meat and zucchini with mango would have been perfect without the mango, which I have a mild allergy to. Next was a very fresh garden salad, followed by corn soup, which was surprisingly good, although I'd never have chosen this in a restaurant. The main dish of roasted duck with lime flavored sauce, however, was a disaster. The duck was overcooked and rubbery, and I didn't like the sauce at all. The cheese plate included brie, Humboldt Fog and aged cheddar, and was ok, although I've had better. I liked the dessert of warm apple tart with vanilla ice cream. After sleeping, I switched to Japanese and tried the Udon with deep fried tofu, which was really good, and the tea and rice with grilled salmon, which was excellent. After the meal and watching films, I asked for turn down service and one of the cabin crew prepared my bed. I appreciated the inch-thick mattress pad that she added, which really made a difference–I didn't even need a Therm-a-rest, which I hadn't packed in any case. The mattress pad wasn't quite long enough for me, since I'm 6'5″ but it was wide enough, and the pillows were comfortable. The flight attendant also brought bottled waters without my asking, which I appreciated. The soft grey men's ANA pajamas fit me pretty well (better than the seat, or at least the seat's headrest), so no complaints there. I almost never use airline amenity kits. but this one seemed fairly basic compared to more elaborate first class amenity kits I've gotten in the past. The sleep mask looked like a business class one, with its thin straps (better first class ones have an adjustable velcro strap) and the other items were ear plugs, toothbrush with toothpaste, and skincare items from “The Ginza” which included cleanser, toner and moisturizer. There were no moisture masks as JAL First Class offers, or items such as lip balm or mouthwash. ANA First Class, together with JAL First Class and Singapore Suites, has one of the most comfortable first class beds, thanks to the thick mattress pad it provides. And service was gracious and helpful. 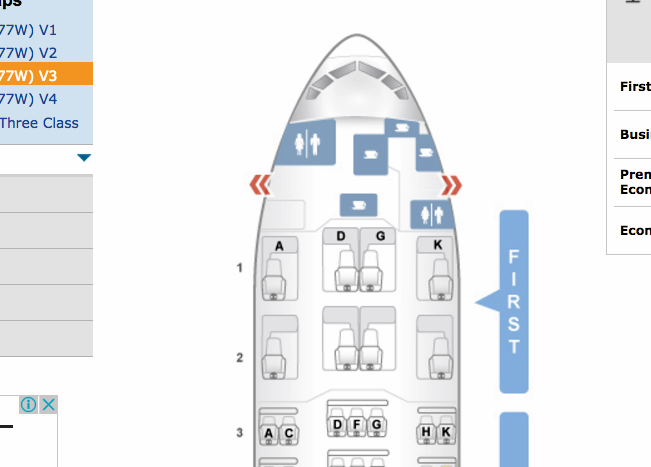 Where ANA First Class falls short is in the seat design, which is uncomfortable if you've very tall, and would likely not work for very wide passengers either. My wife was also surprised to see that the menu was virtually identical to what she had last year–for anyone who flies ANA First Class frequently, it must become quite repetitive. The sleep mask and amenity kits aren't as nice as most other first class offerings from top tier Asian carriers, but the pajamas were very soft and I happily kept them. If you've flown ANA First Class on the 777 recently, what was your experience?